Netgalley: When Natalie’s husband, Joe dies in her arms after a horrific car accident, his spirit enters Dan, a homeless man standing nearby. But how can Dan convince Natalie that he’s not a fraud and her dead husband can live on through his memories? … It will also keep you guessing until the very end; quite simply put, it is superb! Netgalley: I read Beat the Rain and loved it but the Pursuit of Ordinary went above and beyond my expectations, in a good way! Eloquently written and beautifully paints images in the mind. 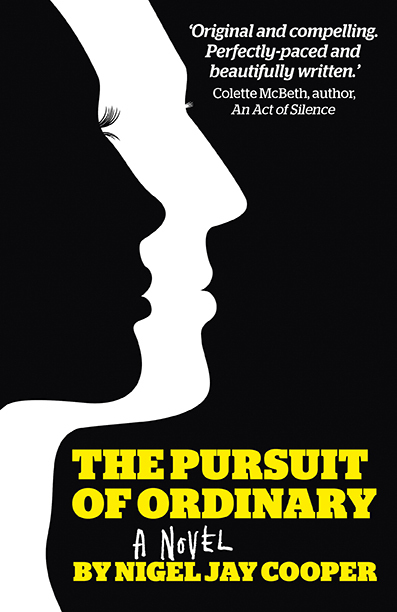 The Pursuit of Ordinary is set to be one of the best books of 2018. Goodreads: What an emotional read this was. Nigel’s portrayal of the characters, and his analysis of homelessness and mental health issues is compelling and at the same time caring. The book keeps you guessing from start to finish and you cannot help but feel for the characters, get involved in their lives as their relationships unfold. They could be one of your friends or the couple next door. This is one of those books you can not put down. Another amazing book, very well done. This is Nigel Cooper’s second book and I found this one as hard to put down as his first. The story draws you in from the start and you just cannot wait to see what is going to happen next. Amazing writer. I found the concept very unique and the writing made it unputdownable for me. Enjoyed Cooper’s the first book and its twist and turns and liked this one just as much. Definitely recommend it! Couldn’t put it down. Definitely recommend this book. It’s one of those books and that you just don’t want to put down. I read the author’s first book also, which was great and this book is just as good. Intriguing story line that leaves you wondering and hooked – loved it. Highly original, a great to read! Amazing story! His writing pulls you in and you don’t want the novel to end! In this case, the title doesn’t say it all. Because there’s nothing ordinary about this book! A memorable read. This is a compelling read, thankfully I was on holiday when I started reading the book so didn’t need to put it down too often! The story offers a fascinating insight into the tricky issues of homelessness and mental health. The story is written from the perspective of all 3 main characters over 5 parts, which provides a brilliant 3D story. I highly recommend this novel, which has left me wondering about a few things! Absolutely brilliant book. Couldn’t put it down. Would thoroughly recommend. Highly recommended. This was a new genre for me, and I will definitely coming back. Really enjoyed this book,loved his first one as well,im not normally a book reader,but my daughter bought them for me,took it on holiday and really enjoyed it.nigel your an amazing writer,looking forward to your next one. A fabulous read. It’s my first read of this author and I loved it. This is a truly excellent and original novel. It had me hooked from the first page and it will stay long in my memory. The writing and characterisation are first class. I fell a little bit in love with Dan, the homeless man, who witnesses a fatal accident and believes that the victim, Joe, has become a voice within his head. Joe’s wife, Natalie witnessed the accident and she and Dan become bound together by this shared experience. This novel pulls no punches about mental health and the way in which it can affect relationships. Having said that, it is definitely not a depressing read. It is written with great insight and compassion and some of the conversations between Dan and Joe made me laugh out loud. This is a novel about relationships and how they can define us. It is about love, loss, the human condition and how we can try and fix each other. I loved it. Do yourself a huge favour and read this book. Finally, I think it would make a tremendous film. A fabulous read just can’t put it down. Very impressed with this author. Look forward to reading more of his work in the future. Loved this book, as I did his previous one, Beat The Rain . . . looking forward to more. This book is very on trend at the moment as homelessness is a major concern. I really enjoyed reading it and couldn’t put it down! Amazing insight into mental illness. Great book, great author, loved his previous book, “Beat the Rain.” Couldn’t put this book down. I very much enjoyed the book, and can recommend it to anyone who likes mysterious stories about ordinary people. Amazing book. Very insightful about human insecurities and characters. Made me think looking forward to the next Cooper read.